Other websites of this company include 13Markets.com. The PoundCrusherEA is a forex expert advisor. The Pound Crusher EA automated forex trading software for the MetaTrader platform places trades for you. 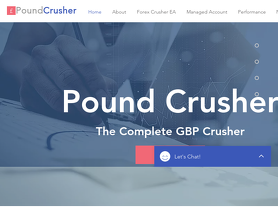 The PoundCrusherEA.com forex robot is no scalping, no hedging, no martingale, and trade in GBP pairs. Wow impressive EA . What they say in their website is exactly true no more fear in GBP. It bit costly but it worth to buy it . Just run the past 2 weeks my account already up about 30% . I am a very happy customer and really recommend them. No idea about what the future can deserves to this EA; but, at least for me, after a few days of use, only can say that is the best one that I have tested, and there have been a good lot of them. The contact with the designer immediate, most helpful, and I think that they are really professionals, no trying to mislead anyone. I bet that it will be a good deal.